Having won $100,000 by the age of 16, worked in a crystallography lab in Germany as a 20-year old, and graced the pages of Glamour as one of the magazine's top 10 college women of 2011, what's left for Isha Jain to conquer? Turns out, a lot. While many would consider prestige a sufficient reason for attending Harvard University, Jain's college choice was primarily science-related: she eats, sleeps, and breathes biology. As a senior Chemical and Physical Biology major at Harvard, Jain ('12) has thoroughly enjoyed her studies as they have allowed her to take advantage of the breadth of subject matter in the sciences. For example, Jain takes classes in chemistry, biology, and computer science – all of which have counted toward her major. Jain has studied biology since her freshman year of high school. By the time she was 16 (just old enough to drive legally in her home state of Pennsylvania), the research from her first biology project yielded evidence that bone growth in zebra fish occurs in a pulsating manner. Having applied her findings to identifying the cause of children's growth spurts, Jain won the prestigious Siemens Competition in Math, Science, and Technology in 2007. Thanks to her zebra fish analysis, Jain took home much more than just a blue ribbon and high praises: for her graduate-level work, she was awarded a $100,000 scholarship, most of which she used to pay for her college tuition. The quintessential Renaissance woman, Jain has since then gone on to achieve an impressive resume of scientific accomplishments. She spent her summer between high school and college working in a crystallography lab at the Max Planck Institute for Molecular Physiology in Dortmund, Germany. At Harvard, Jain's research has led her to study how DNA structure regulates circadian gene expression in bacterial species. Most recently, Jain's success has caught the eye of readers outside of the scientific community. In the 2011 October issue of Glamour, Jain provides an equally pretty face to pair with her sharp mind. 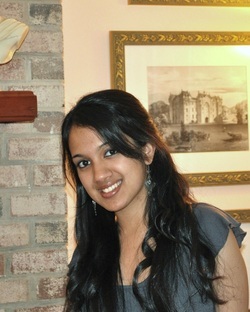 Throughout high school, Jain was often the only female taking a computer science class or competing in a math league. However, despite the numerical disparity in gender, she sees the sciences as naturally being a field in which women could excel. Although Jain has never personally had an issue with the gender divide, she understands the relevance of W.I.S.E. Words Magazine and the voice it represents. Although she has already accomplished so much, Jain is excited for life after Harvard. She has gleaned so much information from college and hopes to continue her work in the biology field.